Oooops, where did that come from? I might have bought some yarn last week. I’m blaming it on 1) my lemming tendencies, and 2) the generous gift certificate to my LYS that my darling husband gave me for Christmas. My lemming tendencies are well-documented. I’ve knit a Clapotis, two Baby Surprise Jackets, two February sweaters (in both the Baby and Lady versions), and countless pairs of Fetching mitts. If it’s one of those popular patterns that I encounter time and time again, it’s probably only a matter of time before I am overcome by the urge to make my own. 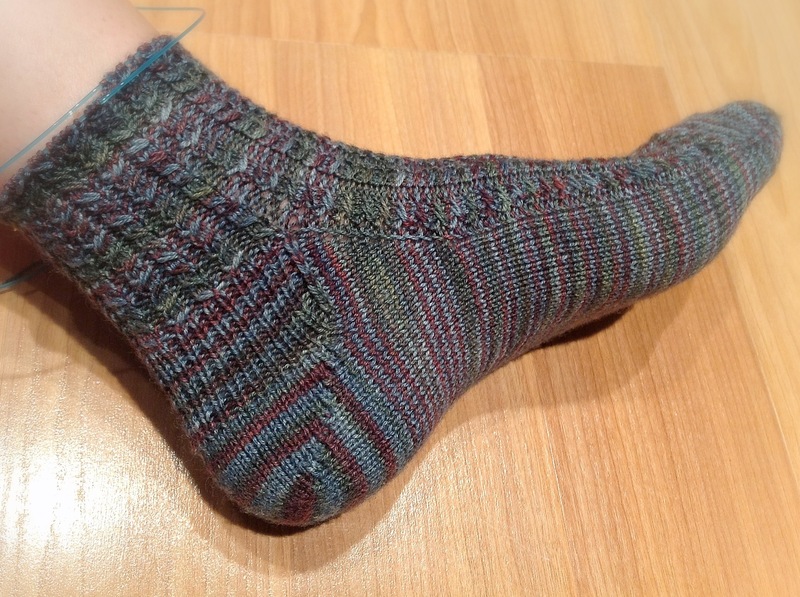 Last May, the Yarn Harlot blogged about her Everyone Outta the Pool socks. I had some gorgeous variegated sock yarn that wasn’t behaving in the patterns I’d tried, so with barely a moment’s hesitation, I ripped it out and cast on for a pair of Everyone Outta The Pool socks. Yarn is Cherry Tree Hill Supersock Select. The colorway is called “Wool in the Woods Lottery,” which I picked up at my aforementioned LYS several years ago and have never seen anywhere again since. I loved working with it– gorgeous color, good sturdy twist, and very little pilling now that they’ve been worn. 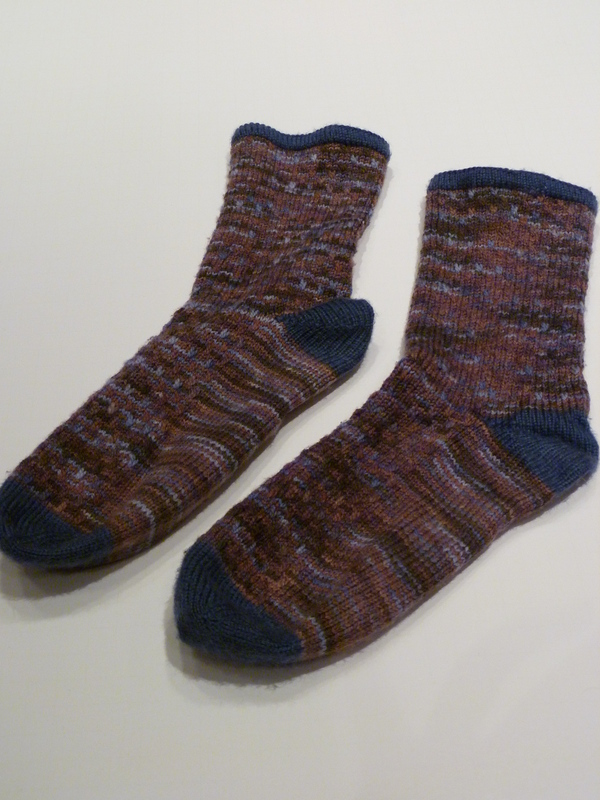 The heels and toes are some Knit Picks Stroll sock yarn that’s been languishing in my stash for a few years. 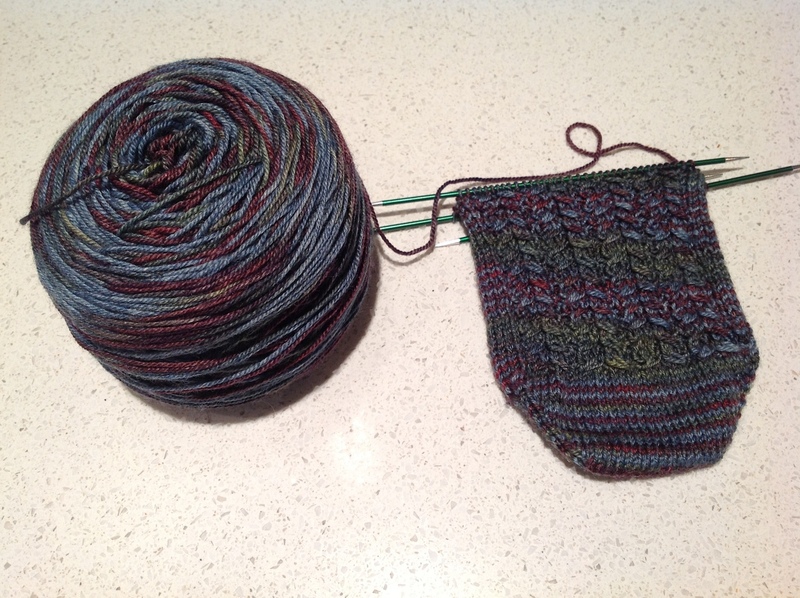 The Stroll is much thinner than the CTH Supersock, and although the color (Dusk) is a perfect match, I wish I’d used something a little closer to the CTHSS in texture, as the heels and toes are already looking a bit pilly. Anyway, back to my stash acquisition. What caught my eye this time? The Lanesplitter Skirt (yes, another Knitty pattern). I poked around in the pages of projects (1389 projects!) 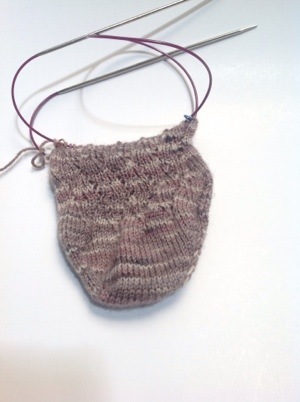 on Ravelry, and it just looks like one of those patterns that is universally flattering. So what’s not to love? I was especially taken with several versions worked in Noro Silk Garden colorway #252, and when I wandered into my LYS with my gift certificate in hand and found that color on their shelves? I was helpless, I tell you! 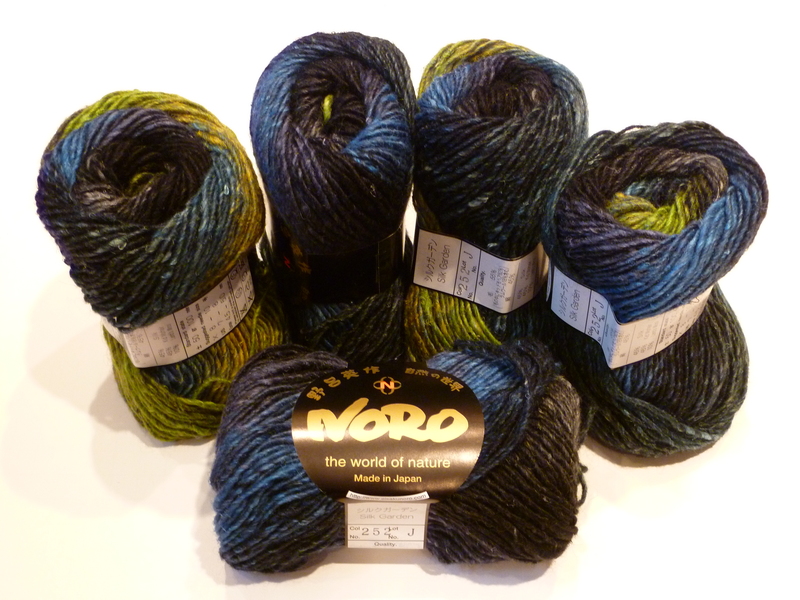 So now I have six skeins of Noro Silk Garden to work with. I have kind of a love/hate thing with Noro. I love the colors, and it’s really quite soft once it’s all knit up. But the knitting of it is somewhat less pleasant for me… it’s scratchy and filled with vegetable matter (twigs and other odd bits), and the skeins have lots of knots, which often change the color sequence completely. So before I can cast on, I will re-wind each skein, separating it at each knot and (if necessary) re-winding the balls so that the color sequence is consistent and I can easily match up the colors when I have to join a new skein. For the most part, I followed the pattern as written. I used the magic cast-on (which was rather tricky on DPNs; I’ve found it much easier to work on circular needles). I got a slightly tighter gauge, so I went up to the largest size, which fit great. I didn’t like the large holes the YO’s in the pattern gave me, so I substituted M1L and M1R. And I finished with 1×1 ribbing instead of 2×2, so I could use the tubular bind-off (which I now love, despite having to fiddle with kitchener). Part of the reason I chose these socks was to learn how to make socks toe-up. This method is now my favorite, since it allows me to make socks which both fit my big feet and are long enough to suit me, without running short on or wasting yarn. 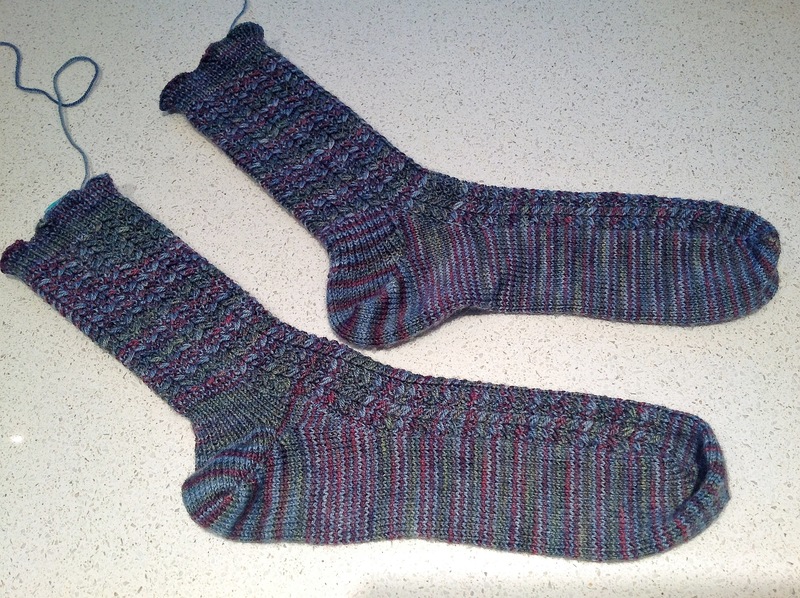 I’ve not been particularly happy with short-row heels, in either fit or execution, so the gusset heel in these socks was also very appealing. Basically, you increase your heel stitch count by approximately 2/3 and then work a heel turn similar to those worked on top-down socks, working back and forth until you are back to the original number of stitches. 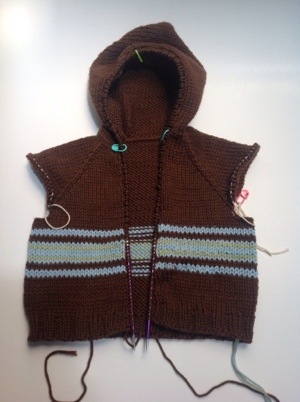 It was easy to work and seems comfortable to wear, and there are no strange gaps or ugly stretched-out stitches that I’ve gotten with wrap-and-turn short rows. This pattern was from Wendy’s book Socks from the Toe Up. If you’re new to toe-up socks, I highly recommend this book. There are good descriptions and diagrams of the various cast-on, toe, and heel methods, as well as some very lovely sock patterns. So I ordered another ball of yarn, finished the second sock (now longer than the first), added 1″ of 1×1 ribbing, and used the tubular bind-off to finish. It looked and fit great! Went back to the first sock, undid the bind-off and the rounds of ribbing, made it the same length as the first sock, and… put both socks in the UFO (unfinished object) basket for more than a year. No idea why. I pulled it out the other day and in less than an hour, I’d finished the cuff, worked the tubular bind-off, and woven in the ends on both socks. I love them, and I’m kicking myself for not finishing them up sooner! 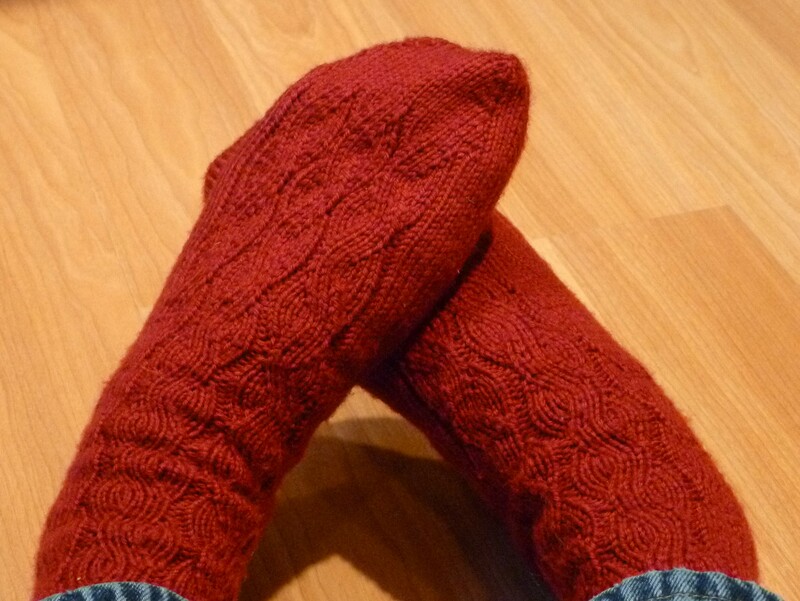 Pretty red socks… just in time for Valentine’s Day!